Increase your redstone possibilities and learn assembly programming at the same time with the Minecoprocessors Minecraft Mod! The Minecoprocessors Mod adds a redstone processor block that can be programed similar to a real microprocessor. 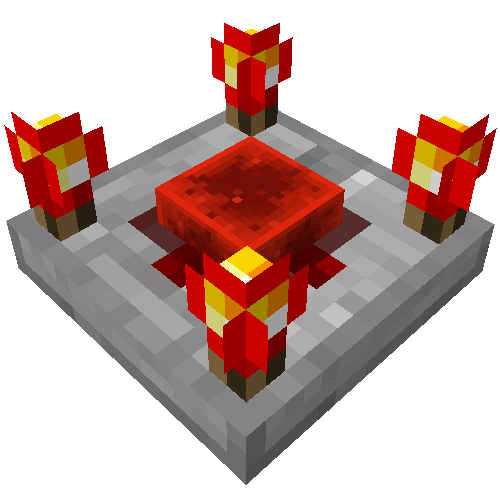 The redstone processor block is styled to look and operate like the other redstone blocks in the game. Please feel free to include Minecoprocessors in any modpack. No need to ask for permission. do you ever have any plans on making more kinds of processors? ive had a lot of fun with the mod, but it feels like there could be some room for more stuff. Thanks! I have thought about, wasn't sure how much interest was out there for it. What did you have in mind? well, I had thought about the mod having 2x2 square areas for more inputs and outputs, so making adders would be easy to make. that was my only thought from 2 months ago that I thought would make sense. P.S. I forgot my password on my other account so I made a new one. Thanks! You might know this already, but just in case you don't, you can use multiple pages in the books. I like to put my subroutines on different pages. That should allow you to hold some fairly complicated programs :). Also, thanks for sharing your program! It's neat to see how people use these processor blocks. Is it possible to set the sleep flag? mov s,0x01 doesn't work. When the input pr gets a pulse, the main program will run once like intended. I noticed that the input also awakes it from sleep... so instead of running these two lines all the time it could just sleep... and use less resources? Does it make a difference? You can use WFE (wait for event). That command will put the processor in sleep mode until one of the input ports goes from low to high. There is an issue I found in testing however, sometimes the processor will not wake when it should. I think this is something to do with chunk loading but I never was able to track it down. Thanks! WFE seems to work for me. Yeah, I think that happened on Saturday. I am still learning the new way. From what I have seen so far I like it better, but I just don't have it working yet. I will update this mod once I get that figured out. I uploaded a new 1.12 version to hopefully fix this issue, please let me know if you have any issues with it, thanks! This brings back memories of my Z80 programming days. I'll check this out. can this essentially be used to make different logic gates? You can do much more too! I have currently used it in my survival world as a controller for a piston based mob grinder. I am also now using it to control my cooked chicken farm which it excels at since a single pulse is required to dispense the egg along with a double pulse to dispense and retract the lava. I see that there are push/pop stack instructions - how does the stack work? Is it separate from the registers? Do any operations make use of the stack besides push and pop? Currently the processor has a 64 byte memory only used for the stack. I might add memory addressing support to the operands in the future so that that memory could be used for more, but currently the only way to interact with it is through push and pop. The only other instructions that interact with the stack are the call and ret instructions. They use the stack to save the return instruction pointer value. oh baby, assembly in mc o__o but its only 1.11? q.q i need a 1.11 pack then.